Firstly, evaluate how big is your RV and whether you would like to have one or several toilets. If you are aiming at installing a second toilet then you might want to consider a vacuum one or a macerator toilet for your second unit as these models do not need to be placed exactly above the liquid waste tank. Instead, the waste can be pumped up to 20 meters away through the sanitation hose to your waste tank. Secondly, evaluate the amount of space you have in your bathroom and whether you can fit a full-sized toilet in there. Also, sit and think about whom you are most likely to travel and whether you are going to have small children or elderly on board because low-profile toilets that are not installed on a platform will be hard to climb for them. Moreover, try to avoid toilets that come with a foot-pedal flush and instead look for toilets that have the traditional flush wall switch or handle on the side of the water tank. Furthermore, think about how often you are going to travel and for how long as well as how often you are going to have a chance to dump your waste tank. How To Avoid Bad Odors? How often are you going to find yourself away from electrical power and water supply? If the answer is often then you might want to consider investing in a portable or cassette toilet as they work independently and have water tanks that you can pre-fill with water. The Thetford pedal flush RV toilet has been reported by many customers to be really comfortable and convenient in use. Plus, it is very easy to clean as the toilet is designed to have minimal crevices, corners and grooves and can be flushed down using the pedal at the bottom. Moreover, the skirted trapway creates a flawless look and enables easy cleaning plus the dual flush system only uses about 1.2 gallons of water per flush making this Thetford pedal flush model very water efficient. Furthermore, the toilet uses a syphoned flushing tube that reduces the noise and helps prevent leaks, clogs and other problems caused by waste. The seat is designed to have an optimal height for seating and standing and does not weigh much when compared to other similar models. The toilet is made using vitreous china and comes with pre-installed seat, wax ring, bolts and a very clean instruction booklet. Plus, the packaging contains a hand wrench for tightening the bolts and screws. Also, the toilet has been tested for water efficiency and found to comply with the strict UPS and CSA guidelines. Dometic toilets are designed to be used in small spaces including RV’s and are made to use a minimal amount of water. A feature that is great for recreational vehicles. The toilet has a side foot pedal that can be used to flush the contents of the bowl plus the toilet has been finished with a resistant layer so as to prevent rusting, scratches and scuffs marks plus the elongated front bowl is fitted with a SoftClose seat that quietly closes and opens. Moreover, the seat is designed to be at a height of 17 ¼ inches making it optimal for short and tall individuals alike. Plus, the bowl is easy to clean and much more resistant to water and rust markings. Furthermore, this toilet has been tested and ADA certified. Dometic Pedal Flush RV Toilet is designed with an integrated tank for seamless and easy to clean design without any crevices, hooks or corners. It is made with a comfortable height seat that offers individuals’ chair-height seating that will suit everybody. The seat and the lid are also included in the packaging as well as clear instruction on how to set it up and adjust all the necessary screws and bolts. Moreover, it is very water efficient and the bottom pedal flush packs a strong water push to eliminate any possible clogs due to waste, paper, or other waste. However, customers have reported that the flushing does make a little more noise than other models in this price segment. This model has been designed to be used on RV’s, boats and other recreational vehicles hence it comes with a removable 5.3-gallon tank. Moreover, the sealing slide valve has been implemented to lock in unpleasant odours as well as prevent leaks. Plus, the one-piece design will eliminate the need for frequent cleaning especially between the bowl and the tank. Customers have reported this model to work flawlessly with a strong flush and bearable noise level. Thetford Portable Adult Potti is made with ergonomic and easy to carry handle plus, it is made with a durable plastic layer that gives it a beautiful shiny finish that is resistant to scratches, stains and waste sticking. The seat is adjusted to a universal height making the seating positing comfortable for a wide range of users with different body complexions. Moreover, the bowl can be flushed using a spray bottle or little water from a cup filled with water and detergent for extra cleaning power. On most occasions, the system will flush down even the heaviest of solid waste in one single flush cycle. Plus, Thetford toilets have been certified as ADA and CEC compliant as these toilets usea minimal amount of water regardless of where they are used; whether it is a boat, RV or a camping caravan. Sleek and beautiful one-piece compact design toilet manufactured by Thetford, plus you can choose from 2 different colours. Moreover, the tank is very easy to clean while the non-stick finish practically eliminates hard waste from sticking saving you the time you would spend cleaning the left-behind waste. 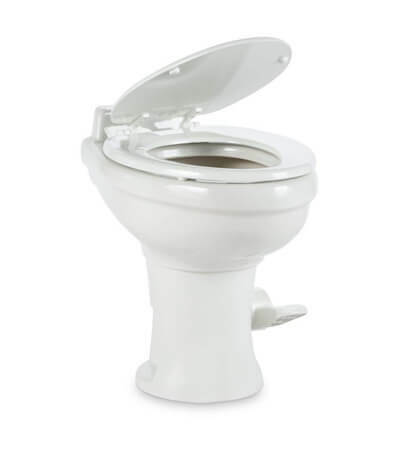 The elongated bowl is comfortable to sit on while the SoftClose seat makes very little noise when opened or closed. Furthermore, the cyclone syphon system is water efficient using only 0.8 to 1 gallons per flush thereby saving you lots on water bills. This feature is extra useful in recreational vehicles when you are away from the water supply. SereneLife toilet is popular among RV owners because it is very portable, convenient to use and easy to clean. Plus, you can clearly see what level the waste is at and consequently plan when you will need to dump the tank’s content. It has been tested and found to be natural, safe and very eco-friendly making it a great option for woodland cabins, RV’s and homes that have an unstable water supply. Moreover, the hand cracker agitator helps in quick composting while the self-contained tank is designed to divert liquid wastes. The toilet is sturdy thanks to stainless steel carcass and a durable plastic outer shell that is easy to wipe clean with a disinfectant or liquid soap. Customers have reported that the compost container is easy to disassemble for cleaning or other purposes. The packaging contains all the necessary parts for assembly; however, the external vent will need to be purchased separately. Also, the SereneLife toilet completely operates without any water and can stand harsh and frequent use without needing much cleaning between the uses. Camco 5.3 gallon removable tank toilet is a very tiny toilet model when compared to other similar models on the market in this price range. Hence, it might feel very uncomfortable for individuals that are tall or weigh more than average. However, it is easy to install even in the tiniest toilet room plus you can clean it in a number of ways including by using a spray bottle filled with bleach or vinegar. Moreover, the elongated seat can be removed whenever needed for easy cleaning or seat changing. Plus, such a model will allow you to control the amount of water used for flushing while the waste storage tank ensures that even solid wastes are easily decomposedwith a minimal amount of soil. Camco Premium RV toilet has a very low water consumption at just 1.28 gallons of water per flush plus the toilet is covered in a stick-proof layer to ensure no waste ever sticks. The finish protects the bowl from fungus, mould and mildew as well from sticking to porous porcelain and ceramic surface. The finish work is great because it seals the bowl with an ionized barrier and creates a super-smooth surface that is easy to clean with a flush. Furthermore, the SoftClose seat has a comfortable ergonomic design and moulded bumpers as well as polypropylene finish to prevent the common and annoying toilet seat bump. If needed, customers can order a separate seat they can later use to replace the old one. All Camco Premium seats are made to fit all models regardless whether the toilet model is regular or elongated. Often, the problem of stinking toilets lies in the waste holding tank that is located directly below the toilet. Because the toilet opens up right above the tank this allows the odours to rise and fill the RV bathroom. The solution to this problem can be the installation of a vacuum or macerator toilet as they can be installed without direct contact with the waste collecting tank. Moreover, in gravity-flush toilets, the water in the bowl acts as a barrier between the air in the bathroom and the odour in the sanitation hose. However, you would need to regularly check the seal and the flush ball to ensure that the valves stay clean and that water does not leak out or down the bowl. Keep a close eye on the mineral buildup such as watermarks because this can damage the water seal. Also, regular tank treatments will help prevent bad odours as well as the spread of bacteria. Plus, pay attention to good ventilation regardless of the season. With RV portable toilets that come with a waste tank, the situation can be a bit trickier hence make sure you have enough ventilation and regularly dump and clean the tank with bleach or vinegar solution. In conclusion, I would like to say that no matter what toilet model you will decide on, the most important thing to do is to regularly clean the toilet with all the sanitation tubes especially if you have an RV toilet with waste tank.